Using the season to put your parenting priorities in check. Rake the yard. Clean out the garage. Go through closets. Donate unused items to charitable organizations. Wash the windows. You know the drill. It’s called spring cleaning. But what if spring cleaning took on a new twist this year, one that would greatly benefit your children? What if you cleaned the cobwebs out of your mind? What if you wiped away all the limiting beliefs that keep you from becoming the parent you always wanted to be? What if you cleaned up a broken relationship, mended a mental fence or reminded yourself about the importance of your role in your child’s life? 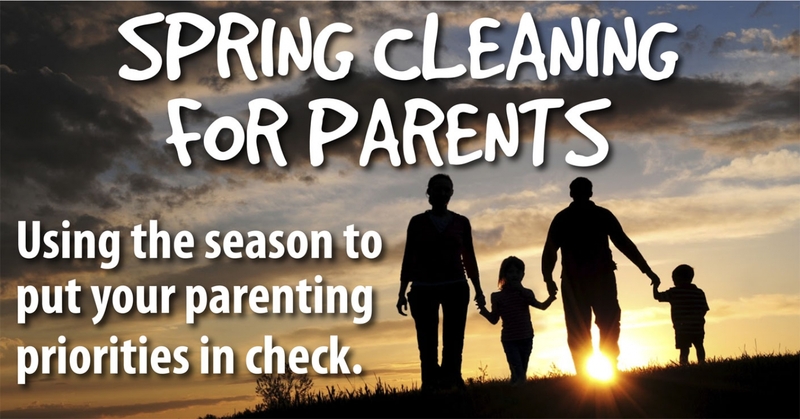 This spring might be the ideal time for cleaning up your responsibility as a parent. Consider the ideas below. Clean out your present expectations and your knowledge of why your children do things. Return to wonder. Be fascinated by what your kids do. Let yourself be awed. Allow your curiosity to bloom this spring. Judgment keeps you from seeing your children clearly. If you judge a child as lazy, you are less likely to see ambitious behavior. If you judge your child as uncaring, you will have difficulty noticing your child’s benevolent acts. Clean the lens in your eyes by reducing the number of judgments through which you perceive your children. Be out of your mind. Use silent times to wash old and useless thoughts from your mind. Resist the urge to overanalyze parenting issues. Stop thinking and cluttering your mind with incessant chatter. Listen to your heart. Follow your intuition. Pick parenting strategies that have your heart in them. The best present to give your children is to be fully present when you are with them. Throw out thoughts about the future and the past when you interact with your children. There is only one moment to see, feel, express, learn, grow or heal with your children. This is it. Every child in the world spells love: T-I-M-E. Adjust your priorities. Pick through your list of social and business activities, limiting old obligations and habits that prevent you from investing time in your children. Spring is the season of new beginnings. Do you need to start over with one of your children? Do you need to make amends? If so, tell your child what you learned and what you intend to do differently from now on. Then follow through. Reduce your need to explain, lecture, moralize, rationalize and convince. The first step towards love is to listen. Give your children the gift of your presence by hearing rather that telling, by acknowledging instead of convincing, by understanding rather than jumping to conclusions. Cleanse your mind of the notion that there is one truth. You know your truth. Allow your children to find theirs. Model for your children how you live your truth. Support them in their efforts to find their own truth and encourage them to trust it. What parenting issues need to be addressed in your home? Do you need to fix a relationship, a recurring stress or the use of TV and the Internet? Fix your mind first so you are attuned to fixing problems rather than fixing blame. Maintain a solution-seeking mindset as you resolve things this spring. Give yourself a perception check. Remember, you can choose to see any parenting situation differently from the way you presently see it. Perception is always a choice. Clean up your mind by asking yourself, “Is this way of seeing this problem the one that brings the most light and love to the situation?” Use springtime to enlighten your parenting perceptions and actions. A thorough spring cleaning of your parenting style could make your home sparkle. It could be like a fresh coat of paint that brightens the exterior and the interior of yourself and your children. And brighter, cleaner, healthier family relationships could well be the result of your spring cleaning this year. Happy cleaning.